A young man, apprentice who fled after killing his elder brother and his wife in their home on Saturday has been arrested. 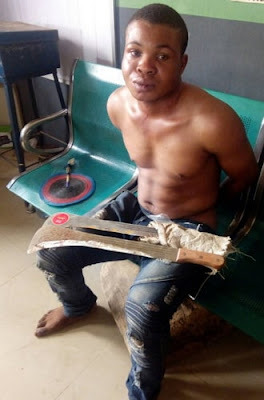 The suspect Okwudili Okoro killed his blood brother Azubuike Okoro and his wife Jacinta while they were having their lunch at the home in Ijako area of Ota Ogun state. The suspect who contracted one Kenneth armed with sharp cutlasses hacked the deceased to death as they barged into their home over the weekend. The main suspect, Okwudili was arrested after neighbour of the deceased, Joseph Nwagu reported the murder at Sango Ota Police station. In his confession, the suspect said he killed his brother because he refused to settle him after 3 years of apprenticeship. The corpses of the victims have been taken to Ota General Hospital mortuary for autopsy. The suspect has been transferred to the Homicide section of the state’s SCIID for investigation. Wicked boy from the pit of hell!! !